Welcome to Old Radio World! 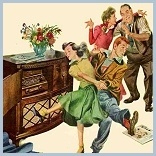 Here at OldRadioWorld.com you will find some of the most popular radio programs of the 1930s, 1940s and 1950s. Before television, radio provided entertainment by presenting radio plays and programs of mystery, intrigue, and comedy. There was also news and soap operas. If you are new to old time radio, have a look at how the sound men created the broadcasts with sound effects. The nine minute video, "Back of the Mike", begins with a child listening to the radio and his imagination is put on the screen. The camera then goes to a 1930s era radio sound studio where the program is originating. This video gives you an insightful look at how those intriguing and astonishing sounds were created.